So I cleaned out our closet this past weekend and gathered two bags of clothing... and I actually found myself still pulling things off hangers last night to add to the donate pile. This is the shot that particularly drives me up the wall... 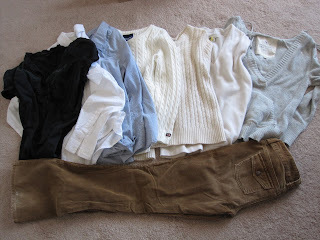 The husband has no problem hanging up his slacks, but the khakis... grrrr... oh the khaki's just get thrown over my tank top basket every week... kills me. 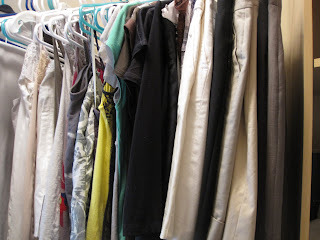 Well, not that exciting of a post, but I had promised to share - and who doesn't love checking out other people's closets?? Just a reminder, I'm still looking to share to some of my closet cast-offs, let me know if you're interested! 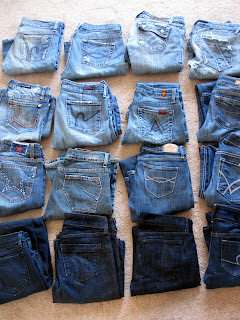 You're not getting rid of any of those 16 pairs of jeans??? 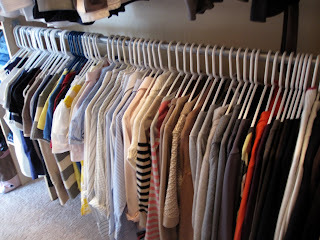 oh my goodness, I am in love with your closet - it's so organized! I'm the same way with my side of the closet - everything has it's place! 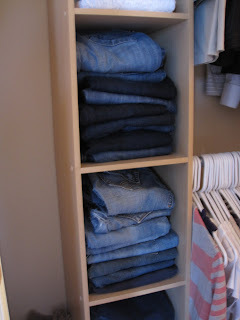 the only problem is that I have NO shelving for my jeans, so they end up on the top rack. 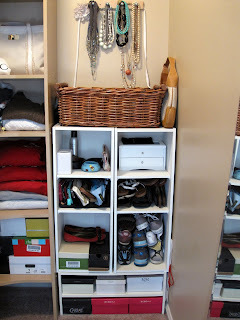 where did you get the shelving in your closet? I am jealous if your closet!!! 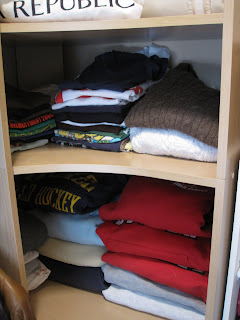 Mine is so tiny I have to divide up my stuff in to three tiny closets! 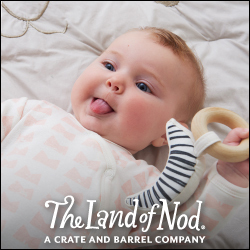 I would love one like yours!!! 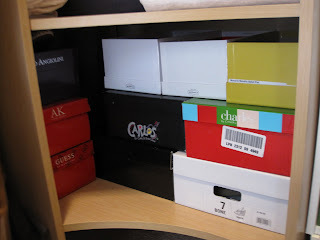 I'm loving that corner shelving that you have in your closet. Our has so much wasted space and it drives me batty. Looking at your closet makes me realize that I have way too much clothing. Mandee - the shelving was there when we bought the house, although it really just looks like ClosetMaid or something from Lowes... And I'm anti hanging jeans.. don't know why, but whenever my past roommates would do it, it'd really bother me... I'm so strange sometimes! Amber - you might hate me for this, but I was actually disappointed in the closet when we bought the house. 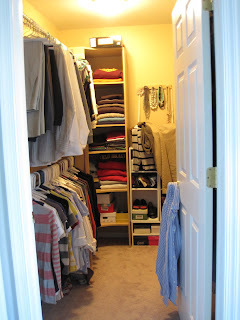 It's actually a downgrade from the closets I was spoiled with in my last 3 apartments - yes 3! apartments with awesome walk in closets, that I didn't have to share! haha. 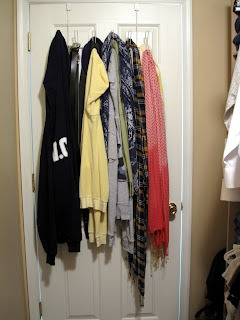 wow you're closet is GORGEOUS. I wish I had a walk in. Your closet is gorg E! Love all of the cubbies (and your organization!). Yay for purging! 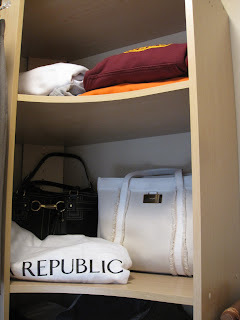 i really love your closet :) Nice and organized! 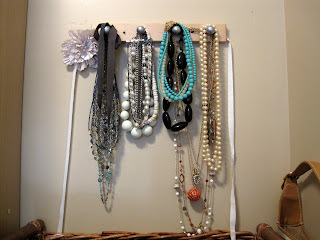 I love that you have your necklaces in it too :) great idea! 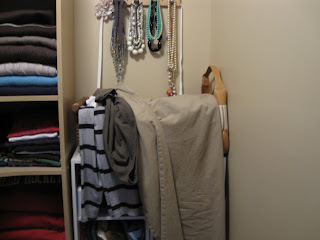 I love having hooks in my closet too, so functional. 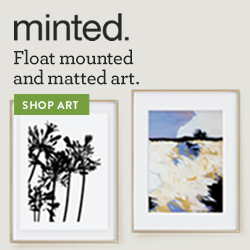 I so badly want to paint ours and add some more decorative things like some DIY pottery-barn-jewerly-hook-frames-thingys :) or maybe some cute Anthro hooks like yours... yup, I have closet envy! 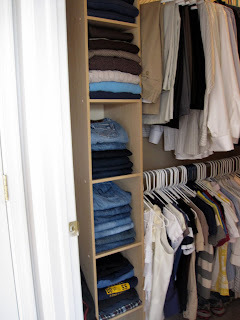 I like your closet - the layout is very similar to mine! I too want to glam mine up a bit with some paint and decor. 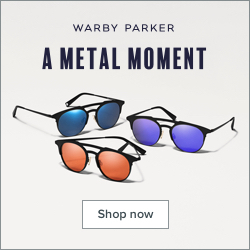 Do you know what color you want to paint? I love that you're so organized. 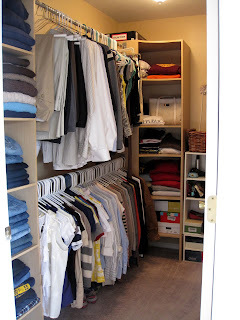 Great closet, I'm so jealous now, this definitely makes me wish I had a walk in too. Jessica - We'll probably paint it the same color as the master bath (which is one shade darker than the bedroom) SW Argos, the bedroom is SW Passive. I love the look of of the glossy white trim/doors and accessories against the color grey blue walls.